I had to think about this one. I have a lot of cars, and very few stock ones that haven't received special treatment, lots of favorites. But if I have to pick just one... OK, well, maybe this one. It's one of my older kitbashes, yet still one of my favorites. A 'plain jane' Atlas centerflow that I did up as a Conditionaire refrigerated covered hopper. 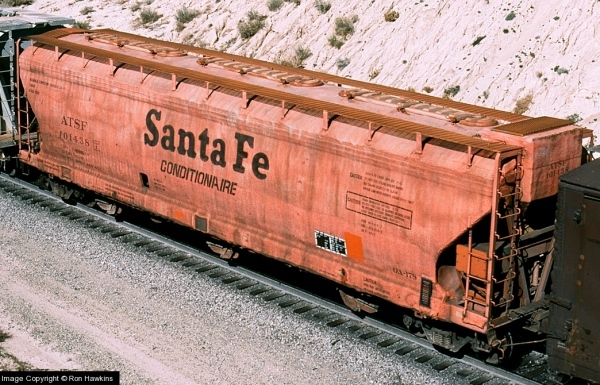 These were one of the oddest all-time cars on ATSF, essentially built for bulk orange transport and failed miserably (worlds largest orange squeezer), demoted into potato service. Insulated with Styrofoam on the exterior that was painted reefer orange, rapidly faded and peeled, attracted dirt, trapped moisture and rust, and resulted in premature scrapping of the entire class even after they were demoted again to plain covered hoppers. Never repeated. 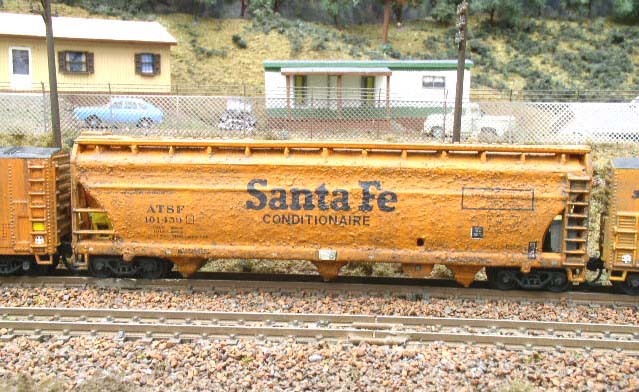 The model was painted in latex paint and rolled in fine sand to get the rough foam surface, then painted reefer orange and the 'conditionaire' is individual letters. It has the refrigerator vents and unit added, and all the other odd details of this thing. http://www.digitalfox.com/digitalfox/Conditionaire/ATSF/atsf101438.jpg by my 1972 era, dirty, but not falling apart yet. I think it’s this load of Farmalls. Oh yeah, I remember those. Nice! Why yes, red with white lettering, of course. I love that body style. My Regal GS is the same way. I have a story I likely shared here before. 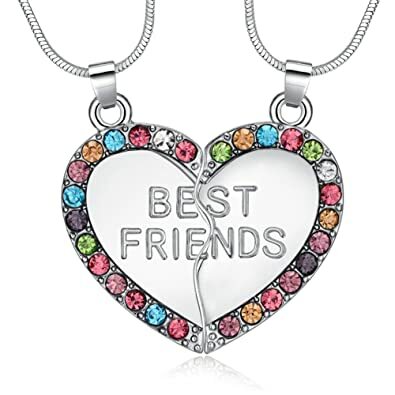 I refer to this as my N Scale Friendship Necklace. It's a metaphor! Here we have the same gon, decades apart. I even tried to make the dents and bulges in the same places, but put more on the CR version. I know at the end of the day, somewhere out there, Eddie K. is out there, with his sheep, staring up at the same moon, and in that moment we (Eddie K. and I, not the sheep) are together. But without a doubt, my FD2/FW1 is my pride an joy of my fleet. So much went in to that damn thing, and so many people here helped make it a reality! And the article that got published paid off my road bike! There's a lot of categories, of course. This car was originally a Trix Postage Stamp Mobilgas tank, obtained with a set when I was about 12. Somewhere around 1986 or so I cut the frames down to "modernize" it, and added the ADM markings to match cars I used to see at the bulk oil terminal near the Fairfield side of the Harbor Tunnel on my way to work everyday. 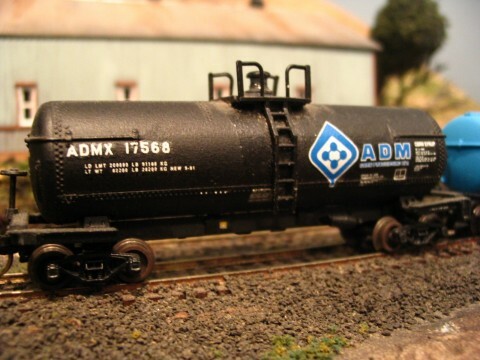 At the time I was modeling contemporary Conrail, and this was one of my first mods to a freight car. It's on the Retro layout as we speak. This icicle breaker was modeled from a few photos from the WMRHS, and is actually the second car like this that I've built. 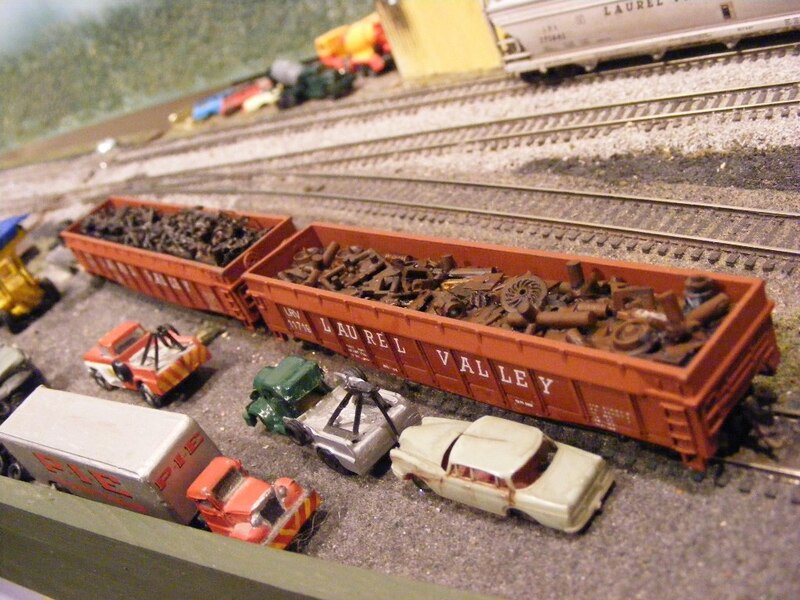 The first one was in the fleet of the museum's N scale layout, but sadly was purloined by a ne'er do well. This one is still in my collection, not as well rendered as the first one, but it looks good from my house. 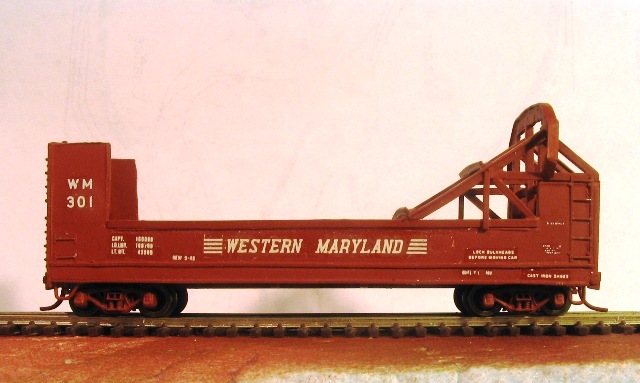 If you say you're modeling the west end of the Western Maryland and don't have a bunch of these, you're not really modeling the west end of the Western Maryland. Just sayin. I started out building the uppers to make an original to cast, but they ended up being so easy to build I just kept on slicin' up the strip stock. I had the yellow lettering printed up to complete the effect. Again, ancient Arnold? or Lima? high side gondolas, rescued from the junk bin and lettered for the Laurel Valley, and loaded with actual scraps from my actual scrap drawer. Maybe you can see chunks of Rapido couplers, leftovers from Micro Trains conversion kits, and numerous other bits and pieces that I glued together and painted a rusty hue. I like that Fox Valley did the wagon top car so nicely, but to really get that oil canning effect, you have to find one of the old Precision N resin cast kits. Sorry I didn't have a short answer! Tough choices for me, as there are many I've scratchbuilt or kitbashed that could fill that role for me. For a freight car, I'm leaning toward my FGE steel plug door ice reefer. For the passenger car, it would be the deluxe heavyweight diner. I'd say this one probably or the second one but probably the third or fourth one when I finally finish them. BTW, it's a PRR prototype, Class G36c. 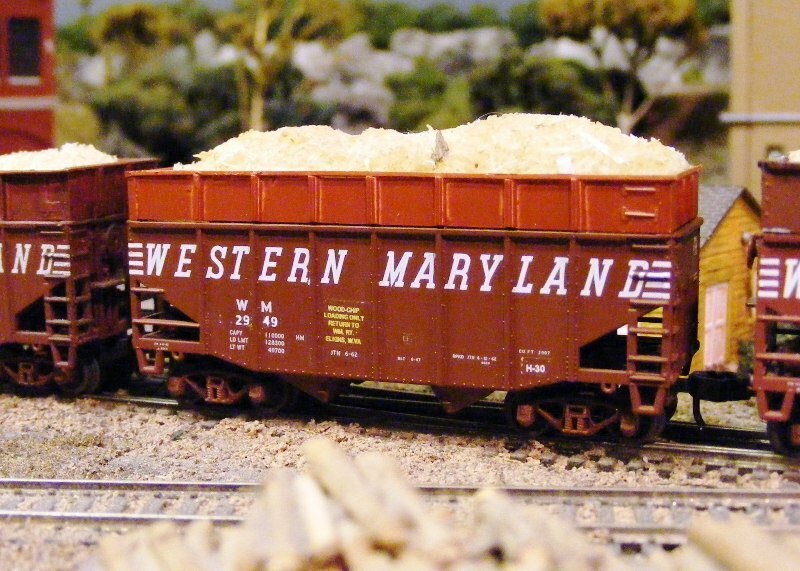 As part of the original release, it was lettered for (among others) Western Maryland. and the WM model was green... 3 of the ones I did for my LRV were such cars... Abominations that had to be subdued!! These are great! 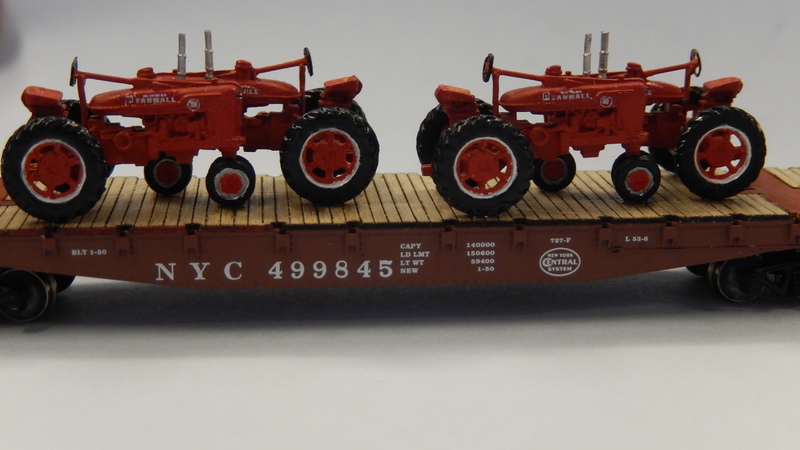 Where did you find the IH decals?